PARSIPPANY, NJ--(Marketwire - January 25, 2011) - PNY Technologies®, Inc. ("PNY"), is set to introduce the newest addition to their line-up of NVIDIA® GTX 500 series GPUs: the XLR8™ GTX 560 Ti 1024MB graphics card. PNY's XLR8 (ac-cel-er-ate) GeForce GTX 560 Ti Enthusiast Edition graphics card is designed to deliver the best Direct X 11 tessellation performance in the latest games. With PhysX® to deliver more realistic gaming effects, CUDA™ technologies to accelerate image processing effects such as motion blue and depth of field, and 3D Vision support to experience games and movies in full HD 1080p stereoscopic 3D; the new GTX 560 Ti graphics card offers tremendous gaming power at a sub-$250 price point. Crafted to be lightweight, yet strong, the GTX 560 offers a durable option to consumers. Providing more performance while consuming the least amount of power possible, this graphics card excels in performance per watt ratio. 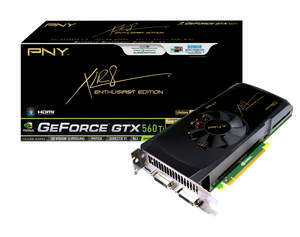 With the purchase of an XLR8 GeForce GTX 560 Ti graphics card on PNY.com, consumers will also receive a bonus PNY 10ft. High Speed HDMI-Mini to HDMI Cable, valued at $39.99 MSRP. "Definitely a gaming enthusiast's graphics card, the GTX 560 Ti offers an exceptional price versus performance value to consumers," said Nicholas Mauro, senior marketing manager, PC components for PNY. "Featuring all the premium GTX gaming technologies and best in class performance, the 560 will clearly be one of the most appealing graphics cards in our extensive line-up." Additionally, consumers who purchase a PNY GTX 560 Ti will receive a bonus 3 month subscription to E-Sports Entertainment (ESEA) Premium Video Game Network. ESEA is a video game solution provider, specializing in community tools, proprietary anti-cheat technology, custom server modifications, and an extensive network of premium game servers. Users can learn, play, practice and compete all with an ESEA Premium subscription. The PNY GTX 560 Ti graphics card will also feature a bonus full-length movie download from Sony Pictures Home Entertainment. Consumers have their choice of over 35 movie titles from a broad selection of genres including Action/Adventure, Drama, Comedy, Romance, Sports, and Family. The bonus Sony movie downloads include recent blockbuster hits as well as favorite classics, such as Crouching Tiger, Hidden Dragon; Big Daddy, As Good As It Gets, 21 and S.W.A.T. PNY offers a Limited Lifetime Warranty for the entire XLR8 GeForce GTX Series, including the GTX 560 graphics card. Users have a standard 1-year out of box warranty, extended to the lifetime of the original purchaser upon completion of product registration at PNY.com within 90 days of purchase. PNY also offers free 24-hour technical support. The PNY GTX 560 Ti will be available for purchase at select e-tailers, retailers, and PNY.com. For more information on the complete line of products that PNY has to offer, visit www.PNY.com. For the gaming enthusiast, visit PNY's on-line gaming portal at www.XLR8gaming.net to participate in forums, special offers, contests and tournaments taking place now! The PNY logo is a registered trademark of PNY Technologies, Inc. All other trademarks are the property of their respective owners. Copyright (C) 2011 PNY Technologies, Inc. All rights reserved.